Here and in the linked articles below, you will find the history of the universe — or more precisely, the part of the history that we know, or at least strongly suspect — and even more precisely, not of the whole universe but rather just the part of the universe (called, on this website, “the observable patch of the universe“) that we can observe today, with many different types of telescopes. We don’t know anything about what lies outside the observable patch; the universe may extend on and on, and many parts of it, perhaps the vast majority of it, may be very different from the observable patch. [So far] I have written articles on three periods of the universe. The most recent period is called the Hot Big Bang. Previous to this may have been a period called Inflation. Here’s what we know about what happened before inflation. We got more evidence in favor of inflation on March 18th, 2014. This evidence did not stand up under heavy scrutiny and is now discredited. Here on this page are some general, overall comments on the history. Despite the fact that almost every popular description of the universe’s history says that “The Universe began with a Big Bang”, it has been known for decades that this statement is highly ambiguous, misleading, and in some ways wrong. First, the Big Bang is not an explosion (despite the name, and despite hordes of books and videos and TV programs that say or imply otherwise.) It involves an expansion of space itself. See here for more details. Third, the modern Big Bang theory inserts a period of inflation before the time when the region of the universe in which we live became hot. Inflation is explained here. Whether you say inflation is part of the Big Bang, or you say the Big Bang begins after inflation, is simply a matter of definition (see the end of the Inflation article). The really important thing about inflation is that during inflation the universe’s expansion was vastly more rapid than it was in the subsequent periods, and also, the universe was extremely cold during that period. Let me say that again: it was expanding extremely rapidly, and it was deathly cold. Bar from your brain any notion that the expansion of the universe inevitably has something to do with it being hot. The Big Bang is not like an explosion, no matter how you define it. Fourth, although people have made scientific guesses about what might have preceded inflation — or whether inflation has a beginning at all — no one knows. That’s where our knowledge completely disappears. Indeed, please remember we’re not even yet sure inflation occurred, though evidence has been growing in recent years. Today, we live roughly 13.7 billion (13,700,000,000) years after the start of the Hot Big Bang. Notice I don’t say that “the universe is 13.7 billion years old” or that “the beginning of the universe was 13.7 billion years ago”… we don’t know that. What we do know is just that the Hot Big Bang began 13.7 billion years ago — but we don’t know if that moment was close to the beginning of the universe as a whole, or anything about what that beginning might have been like, if there even was a beginning. Michio Kaku has never been one to let science get in the way of a good soundbite. This certainly is a start on clearing the air for me. In my mind, it has never made sense that the “Big Bang” was the beginning of existence (the universe). It seems to me that a “bang” implies that something that did the “banging” existed before the bang. This is a flat-out contradiction that no one mentions. BTW, failure to distinguish speculation or guesses from knowledge is unconscionable. Such people should be writing sci-fi books or religion books. I learned of this site via a tweet by Alan Boyle, an NBC News Science editor that I follow. Anyway, I’ll dig into your blog and hope to learn something. Mel, this is a bit late, but perhaps it will help new readers (or you might be notified :)). The name doesn’t mean anything! It was invented by a guy arguing *against* the Big Bang theory – in this case, by Hoyle – the steady-state guy – himself. Some say it was meant as ridicule, but Hoyle explicitly denied it. It was just a cool name, and it stuck. This is not exactly rare in science – Schrödinger’s Cat (Schrödinger was pointing out how weird conclusions the then-interpretation of quantum physics allowed), Butterfly Effect (“So you’re basically saying a butterfly flapping its wings could cause hurricanes?”)… The theory dates to about 1931 – the name was coined in 1949, in a radio programme with Hoyle. But regardless, intuitions aren’t necessarily a good guide when you get far from our ancestral environment. Plenty of people still find it counter-intuitive that light can behave like a wave despite having no medium to propagate in. Or that there’s no one absolute clock that measures time in the universe. Or that (assuming relativity is correct enough) FTL travel inherently implies time travel/breech of causality etc.. Just because you call something a “bang” doesn’t mean it’s going to behave the way other bangs you see around you behave. And if there ever *was* a beginning of space and time, it would make little sense to talk about what was before – “before” wouldn’t even make sense; but “bang” would still be a decent name, since everything (especially time) “exploded” away from that event. Assuming time is a separate entity in the first place (e.g. Barbour’s timeless universe). Thanks! However, I see plenty of references to “the beginning of the universe.” Of course, some religious people love it. But, I can’t reconcile an evolving universe and a universe without beginning or end. BTW, I’m reading “And There Was Light: The Discovery of the Universe” by Thiel 1957. I won’t find an answer there, but it’s a fascinating read anyway. The hot big bang is not only possible within the framework of inflation; indeed inflation was invented quite some time after the big bang idea and there exist today alternatives to inflation. (For example the ekpyrotic universe.) The hot big bang is a robust concept in and of itself. Are there any scientific reason to assume that the universe zero-time age was complete true ultimate Nothingness then from that nothingness space and energy appeared without any physical cause ? Is this what the BBT tell ? Or the BBT have nothing to do with generation of the universe ? As noted above we have only guesses as to what the universe was like a t=0 and in fact we don’t even know if we can say there IS a t=0; is it a sensible question to ask? We may never know. Fred — I think that a “kludge,” in this sense, is simply something hypothesized to fit known data to known equations. Neptune, positrons and neutrinos were kludges until they were actually discovered; geocentrism and the luminiferous ether were also, until better data and equations were discovered. Patrick, I think my problem is I am getting on in years and I was born quite close to Fred Hoyle in Yorkshire. I am still coming to terms with having to grudgingly give ground on the steady state theory. That is my problem with the current theory, every time someone finds a problem like the evenness of the CMBR someone comes up with an explanation that makes it work. I have looked at the some of the evidence released today for observational proof off inflation and I just think they have decided they have found exactly what they were looking for. Geocentrism wasn’t a kludge it was a dogma forced on to people under pain of imprisonment or death. I can’t help thinking that in the last 100 years some scientific theories have reached the same position where opposition to them would be a professional death sentence. Prof Strassler does at least say on many occasions that he doesn’t know or it might not be true that… which is not the norm we hear from most physicists..
It’s true I’m very cautious. But in fact the current theory is working amazingly well. It’s been given many opportunities to fail, and it keeps succeeding. Thanks for replying Matt. I have been interested in Cosmology since I was 15 in 1959 because my father was. I still hurt from remembering the number of times I rubbished the BBT and spouted the SST of Fred Hoyle. I have long ago accepted the BBT but a tiny little part of me still whispers “I wish someone would discover something and say this completely vindicates the SST.” I know it isn’t going to happen but travelling in hope is always better than travelling without it. May I thank you for taking the time to write your blog and the way you manage to explain difficult concepts. I would put you on a par with Richard Feynman in that respect. but with a very large error bar and with the early-discovery bias that tends to make numbers drift down a little after discovery; it will not surprise me if in the end r is found to be 0.1 or 0.15 . – what stage this “singularity” refers to: is it the moment “hot big bang” begins, or when “inflation started”, or something else? – how could it really be a ‘singularity’ in the mathematical sense? Or is it a planck-length region with some undefined or unknowable density? – does this “singularity” become our “observable patch”, or does it also encompass some hypothesized “unobservable” region of unknowable size? I think that nowhere in this recent batch of articles did the term “singularity” appear (or I may have missed it). Is the term too ill-defined to use? While I feel reasonably comfortable with the abstract mathematical concept of “infinity”, and the idea that some infinities are bigger than others — I, like probably most people, have a tough time wrapping my head around the notion of physical things (like hypothetical “unobservable patches”) being infinitely large! The term ‘singularity’ inasmuch as it applies to physics (And not say the technological singularity) is quite well defined. However it is not clear if it actually is something or just a result of incomplete theories. About a century ago there was something in physics known as the ‘ultraviolet catastrophe’ which basically meant that everything with any sort of temperature should be glowing infinitely brightly. This was not a ‘true infinity’ that could ever occur in the universe however as it turned out our understanding of light was wrong. It is possible singularities will turn out the same way. It is almost CERTAIN that the Big Bang “Singularity” will turn out in the same way. The singularity appears when you apply Einstein’s equations; and we KNOW Einstein’s equations don’t apply when the density of energy approaches the Planck energy per Planck volume. So the whole discussion is silly: the singularity is an artifact of using an equation that we know is wrong anyway. The correct statement is that we don’t know what actually happens in the vicinity of this singularity-artifact. I’m disappointed to seeMichio Kaku’s name here in a serious scientific blog. Thanks again ,,you made it so clear now ………Well Done Professor Strassler. As a matter of Fact , many or all Astrophysicists agree that what is before the presumed inflation is UNknowable to science …..then the scientific method itself dictates that no talk is allowed before HBB start to explain naturally what IS UN- natural period. Take it or leave it it is a free country. You seem to miss one fundamentally important point in your exitement over finding what you seem to consider a flaw in the scientific method: if an event or phenomenon is outside the realm of which we can study it is also outside the realm of what can influence us in any way. It sure may be exiting to create metaphysical models of what may exist outside our observable universe or what existed “before”, but such phenomenon can by definition never have any impact on our existance on earth and are thus unimportant to study scientifically. Or to put it simple: A god or creator that has or had any impact on our observable universe must at one point have a way of working within it, either directly or through agents. Any such activity can in theory be observed and studied using scientific method and thus are phenomenon within the realm of science. Anything that has never existed within or communicated into the observable universe is utterly irrelevant for our existance. I must strongly disagree. It is scientific practice to hypothesize. It is testing by experiment that prevents science from becoming unsubstantiated dogma. No one’s going to tell you anything when you start talking about metaphysical issues as ‘scientific fact, take it or leave it’. That statement you make may be true or it may not be, but it is not a “Scientific Fact”. A scientific “fact” has to be verifiable *by experiment*. No Sir , your feeling of whatever you feel is a scientific fact but is not verifiable by experiment .. (( Do not tell me about its correlations , )) it is even more than scientific fact ….what about the scientific fact of space curvature by mass/energy ? Many accept it , does any one measured the mechanism of it ? Just so you know, Matt: I try to keep up a bit with what’s going on in religion and in the New Atheism. (The first is terrifying and the 2nd is interesting but a bit disappointing,) Right now, I see the BB equated to the beginning of everything and used as a very important argument for the existsnce of the Xn god (the 2nd law of thermodynamics having run out of steam and usefulness). I see it trotted out a lot. As some have pointed out, even a god with that much powerful magic is a long way from the Xn personal god of their haunted universe. Anyway, the Xns have a lot invested in the BB right now. When this fails, they’ll find something else. They really should be designing God and ghost detection equipment instead of trying to find holes in BB theory or evolution. They could even try to detect Jesus’ DNA by checking some Catholics after swallowing the holy crackers. Why not trap a demon escaping after an exorcism? someone explain me how to hell death cold (0 kelvin ? less more )inflation give extreme hot big bang that is for me unlogic ? what is with violation thermodynamics law or you say that extreme cold space have more energy that extreme hot how that is posible?? You may want to check the inflation article linked at the top of this page. Basically while the *temperature* (thermal energy) of inflating space is nearly 0 its total energy content is massive due to dark energy. When inflation stops the dark energy ‘flips’ into hot stuff. Think of a nuclear bomb, it is quite cool at room temperature but when you detonate it (changing some of its other energy into heat energy) it becomes very hot. Professor : in almost all decriptions of the BB they put the BB before inflation , while in the illustration above you put inflation before the HBB , i think what you show is more tuned with inflation/multiverse assumption as going together , but what about those wrong illustrations virally circulated in media ? You can see it in Newscientist Magazine . The media says : Big Bang, then Inflation, then Hot Big Bang. I say : Who Knows? then Inflation, then Hot Big Bang. I’m obviously correct because nobody knows what preceded inflation. We have neither data nor reliable theory about it. The notion of “eternal” or “chaotic” inflation, if it is right, could and might eliminate anything like the “Big Bang” in the media’s version. I can’t help it that the media won’t listen to reason, and I don’t know which scientists are contributing to this. But if you taught physics graduate students that we know that the universe started with a Big Bang that emerged from a point, you’d be laughed out of a physics department. Matt. What caused those severe vibrations of the space proper that was measured as gravitational waves …IF …. It is G.W. Really ? Quantum mechanics. This has to be explained in an article, but it’s very, very difficult physics! Matt is essentially correct. Any claim about reality–metaphysical, epistemological, ethical, or political–has to be ultimately reducible to perceptual concretes (including introspection). Thinkers who tried to deduce the facts out of their fantasies have been a big road block. Logic is essential, but it has to work on real data. Thought w/o data is called “rationalism” and it can be a habitual vice that’s hard to break. To gain real knowledge of reality, the first thing to do is look at it. BTW, not all philosophy is fantasy junk; some is inductive. I’ve seen a lot about how inflation began at 10^-35 seconds after the big bang, even on quite serious scientific platforms I respect for their accuracy. Is there anything, any theory or guess, however misguided behind this or is the entire notion of bothering with times before inflation currently entirely without merit? The point is not that it is without merit; the point is that there are many pre-inflation models and we don’t know which one is right, so that means we don’t know the timescales. For instance, if you look at Guth and Linde’s favorite models these days, the times are often somewhat different. Unknown, but hopefully not unknowable- therefore fair game for science. So basically the term “universe” described our current inflated “bubble” of space on which we can make statements about in terms of physics familiar to us. However, there might or might have been something before the Big Moment, when our universe was created, that might or might not be describable with physics as we know it? Before the Big Moment for our inflated bubble, there could very well have been other things — but it can get very hard to define “before” and “after” in a quantum space-time, so one should be cautious even with our words. 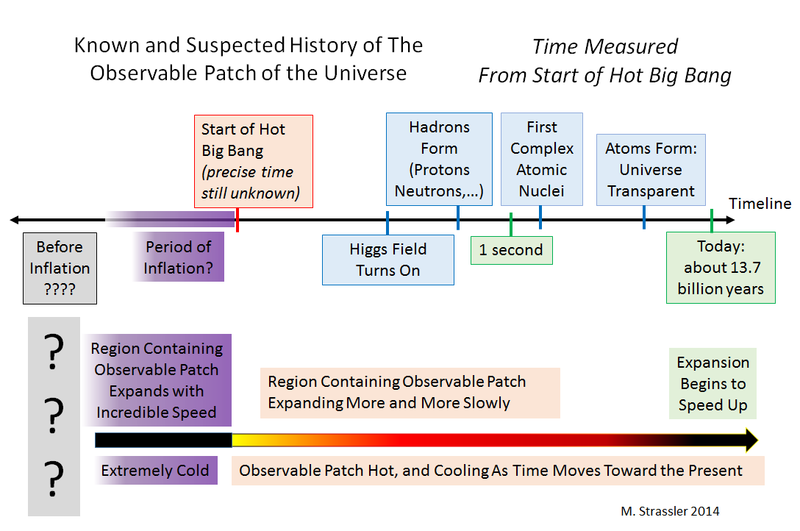 Can you show me where in the CMB this, “the observable patch of the universe,” is?